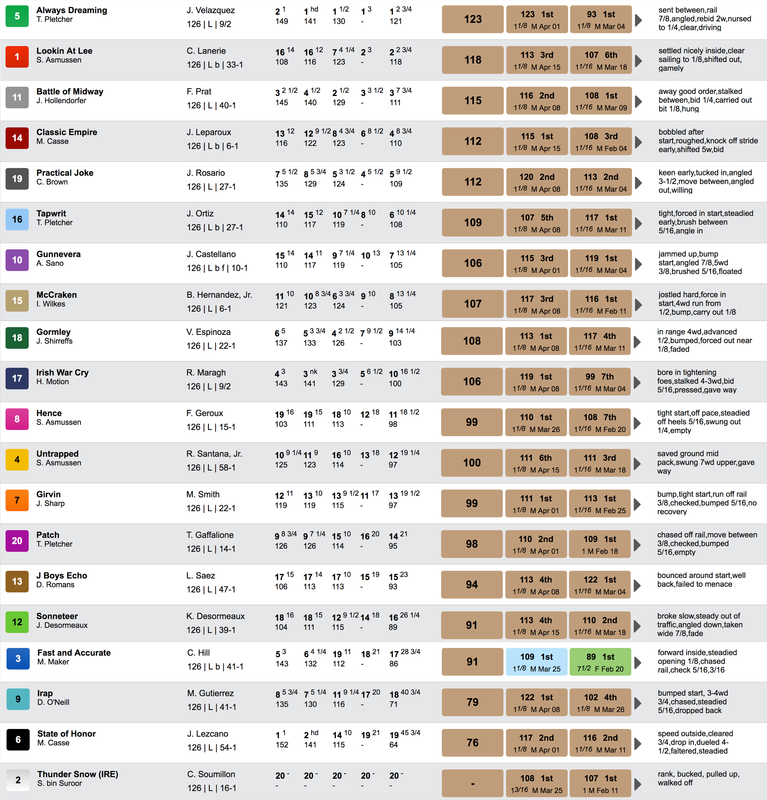 2017 Belmont Chart, with each horse’s internal TimeformUS Pace Figures and Final TimeformUS Speed Figure. Note the lengths beaten is the view you’ll see in the PPs when these horses next race. 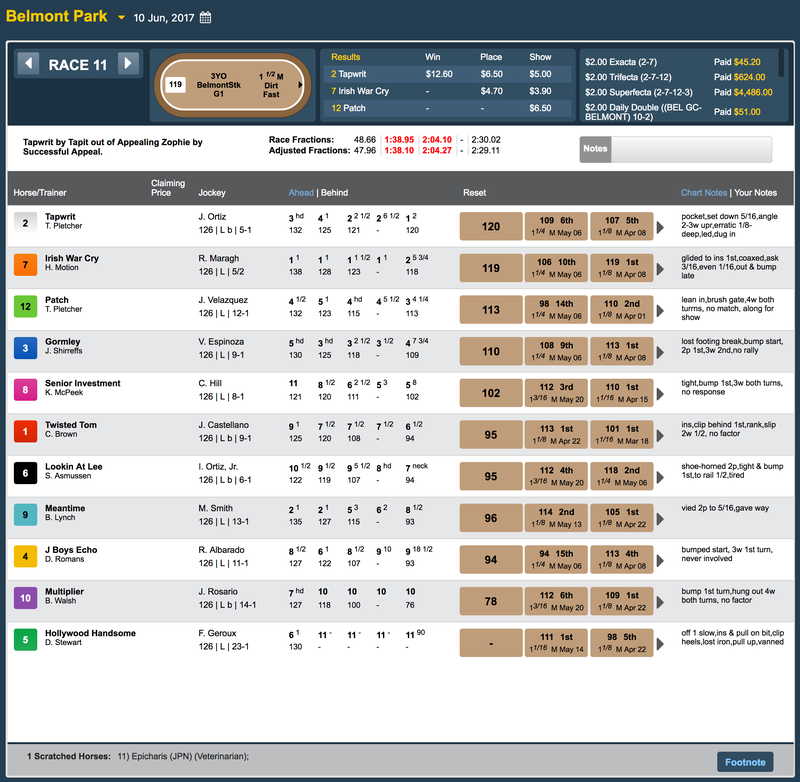 2017 Preakness Chart, with each horse’s internal TimeformUS Pace Figures and Final TimeformUS Speed Figure. Note the lengths beaten is the view you’ll see in the PPs when these horses next race. 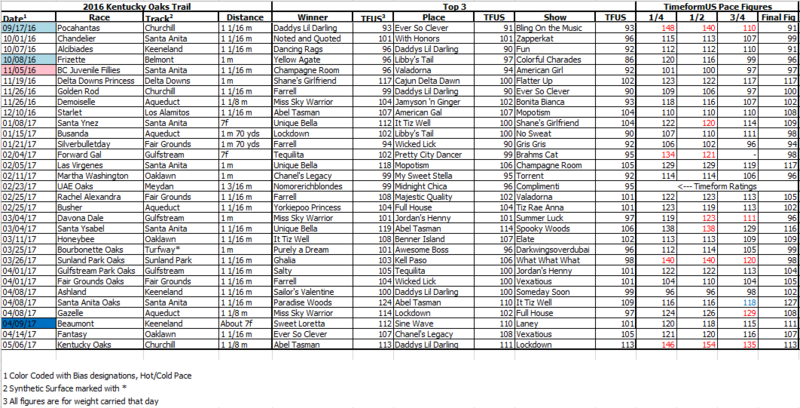 2017 Kentucky Derby Chart, with each horse’s internal TimeformUS Pace Figures and Final TimeformUS Speed Figure. 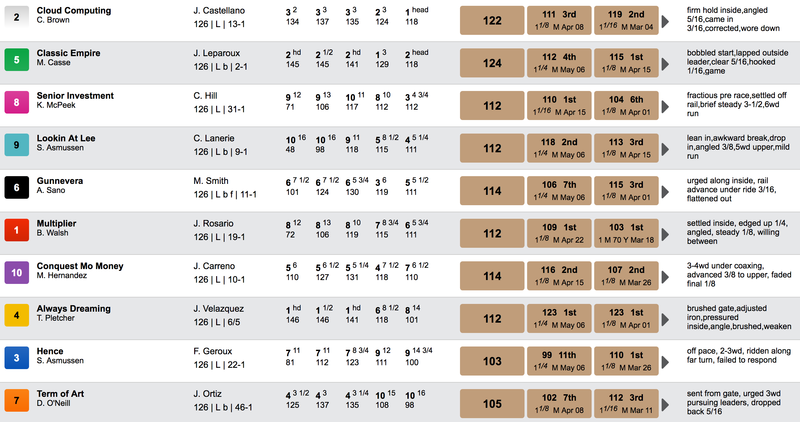 Note the lengths beaten is the view you’ll see in the PPs when these horses next race. 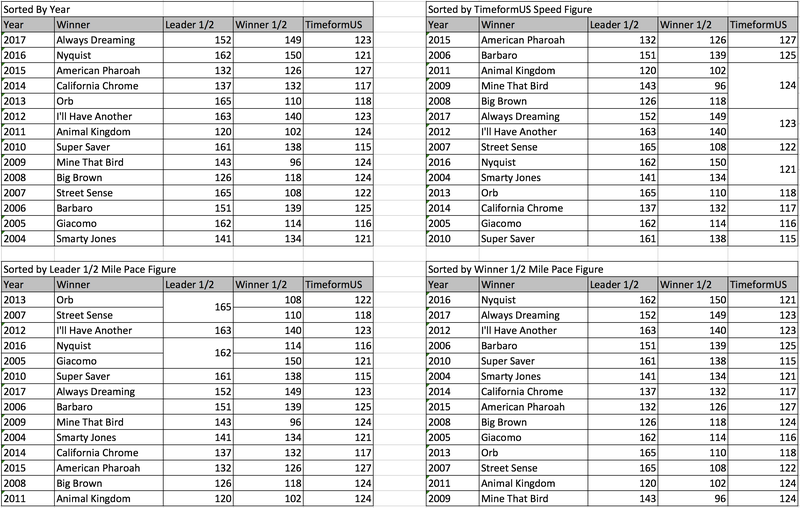 Always Dreaming’s 123 TimeformUS Speed Figure is slightly ahead of the 5-yr average of 121.2. It’s the same figure we gave I’ll Have Another for his win 2012. Like Nyquist last year, Always Dreaming’s 1/2 mile pace figure was extremely fast by our standards. Always Dreaming ran a 149 to the 1/2 mile, akin to Nyquist’s 150 at the same call last year. 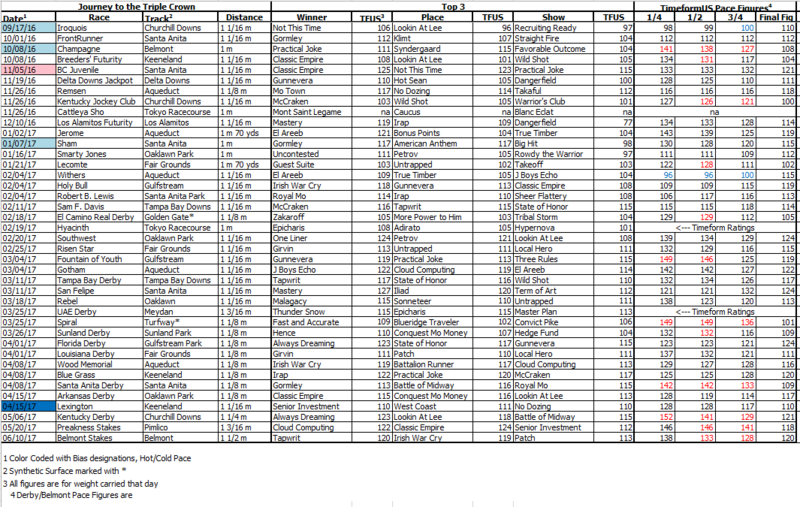 This year’s Derby Pace was fast, as predicted by our Pace Projector, but not as fast as last year’s. Last year’s 1/2 mile leader Danzing Candy ran a 162 TimeformUS Pace Figure while opening a 4-length lead. In the 2017 Derby, State of Honor ran a 152 Pace Figure while leading Always Dreaming by a length.